After attaining a Bachelor of Science at the University of Stellenbosch, Tasmin decided to pursue her future and further her studies Somatology. She obtained her diploma at Isa Carstens Academy. She is incredibly passionate about the aesthetic industry, and continues to study in Advanced Dermal Aesthetics. 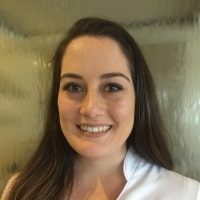 She loves working with people and continues to strive for excellence in giving result driven treatments with loving (and firm) hands.